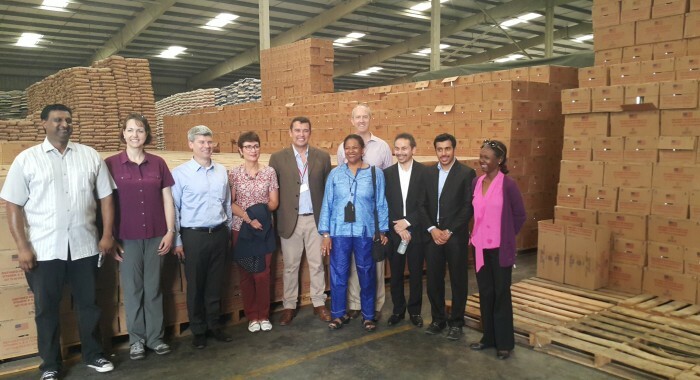 BMMI Djibouti’s warehouse in the Free Zone was recently visited by a VIP delegation from the US Embassy and USAID. Their visit, which coincided with a trip to Djibouti by our CFO & EVP, Ammar Aqeel Al Hassan, and our Young Leaders Programme (YLP) trainee, Yousif Amin, was meant to give them a first-hand and personal view of our operations. The diplomats and officials were able to see for themselves the extent of BMMI’s logistical support for the US aid efforts to help those suffering from famine in places such as Ethiopia, South Sudan, Somalia and Malawi, due to droughts and conflicts. The BMMI team works hard, non-stop, to manage the loading, unloading and storage of huge quantities of vegetable oil, corn powder and lentils. The team works together like a well-oiled machine, loading 40 tons of loose cargo on a double trailer truck within 25 minutes; and loading and unloading up to 35 containers of these vital supplies every 24 hours. The US Ambassador in Ethiopia, Patricia Haslach, and the US Ambassador in Djibouti, John Kelly, both expressed their appreciation for the BMMI team’s efforts, as they were guided through our USAID warehouse and learned more about our operations from Country Manager, David Hanse, and Madre Poobarlen, Assistant Program Manager for Logistics. The visiting delegation also included Hany Elabe and Rabiha Mateen from USAID Djibouti, along with Laura Varhola, Defense Officer at the US Embassy in Djibouti, who all expressed their deeper understanding of the various challenges of distributing food aid once they saw the operations first-hand. From his side, David Hansé expressed how meaningful the work has been for the team. “The BMMI team is very proud to be part of the massive logistical relief effort to help the Ethiopian people during this tragic drought crisis,” he said.